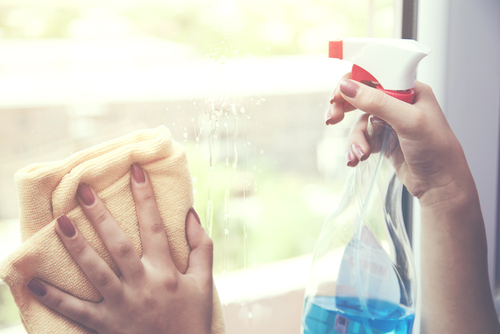 Checking Your Home Security During Spring Cleaning | Basco Security, INC. The weather is getting warmer, so you’re probably spending some time cleaning out some of the clutter in your home in order to let more air get through and open up your space. Did you know that this is the best time to go over your home’s security and make adjustments? While you’re making piles and testing batteries in older electronics, take the time to check your security system and schedule necessary maintenance! There are many things you can check while cleaning up your yard and garden of leftover winter debris. Have you tested each light to make sure there aren’t dark patches of your yard? Note any burnt-out or fading bulbs and replace them quickly to protect your home. If you have outdoor cameras, making sure the lenses are clear and functional after a long winter is critical to catching suspicious activity around your home. Make sure each camera is mounted tightly and securely on each perch to prevent the cameras from falling or being blown away. If your trees or shrubs have overgrown, take the time to trim them back to eliminate a hiding spot for a potential intruder. You should have your house number displayed clearly on your property in order to assist first responders in case of a medical, safety or home emergency. Your home is filled with entry points, though you may not think of them that way. As you clean from room to room, check every door with exterior access and each window to make sure they can lock securely, without wiggling open. If any locks appear loose, contact a locksmith or window professional to repair or replace them. Windows clouded with condensation or smudges should be cleaned to provide an unobstructed view of the outdoors. In order to prevent fires, make sure the fireplace and chimney are swept clean to allow for clear air flow. If you have not done so already, test the batteries in each smoke and carbon monoxide detector. Don’t wait until its too late to schedule security system maintenance! Basco Security can be reached by calling 781-294-4166 or filling out our online contact form.